A family from Penn. checks out the beautiful PNW. Good-bye Anacortes. 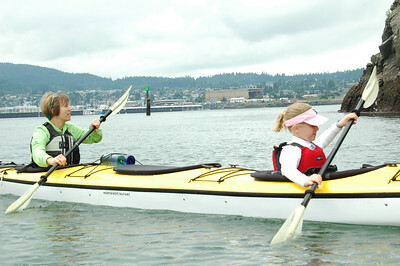 Kim and Laura look ahead to the waters before us. 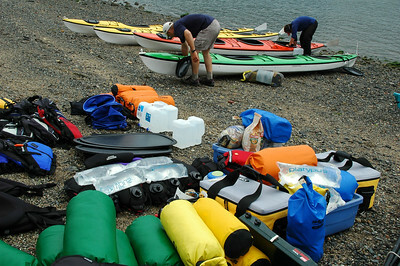 Our guides, Jeff and Chris, get the kayaks set in Anacortes before we all jump in to loading all this gear. 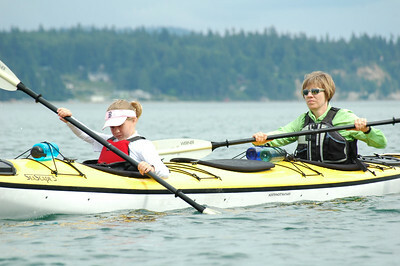 Laura and Kim - paddle in, paddle out. 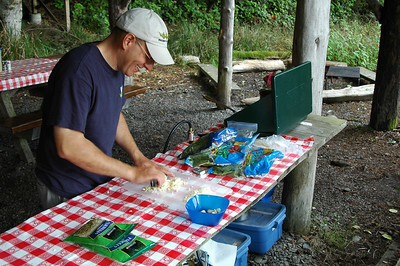 Jeff gets busy on dinner. Chopping garlic for pesto pasta. 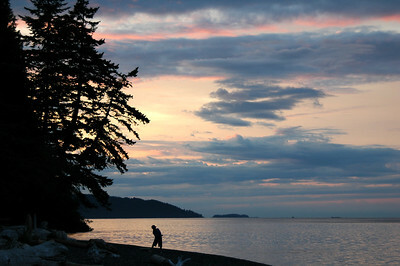 David works his way down the beach skipping rocks on Pelican Beach, Cypress Island at sunset. 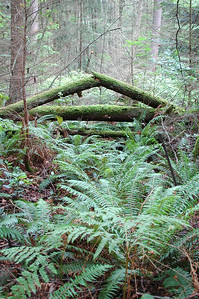 A broken log found while exploring on Cypress Island. 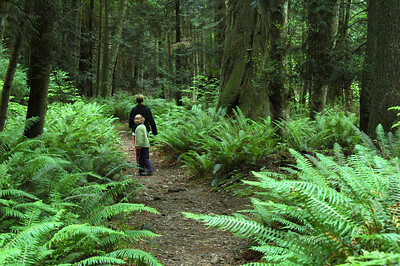 Laura looks back as she follows her mom through a world of ferns. 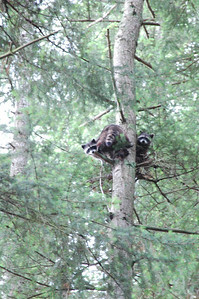 Some curious visitors check out our camp from above... any extra dinner? 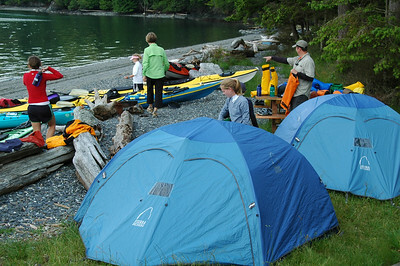 The next morning, we head out for a tour around the north end of the isnald. 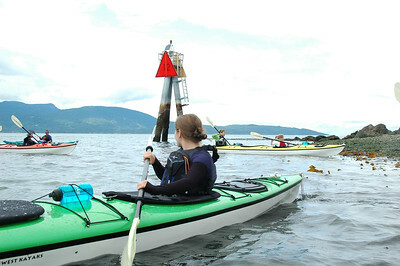 Here Kim, Laura, Natalie and Maria are crossing kelp beds and tide lines. 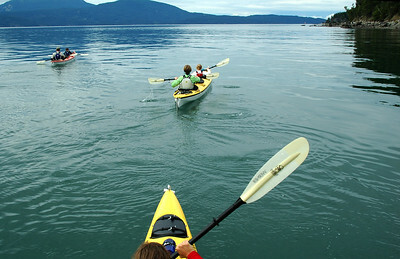 Transiting the north side of the island, we're in the lee of the flow of the tide and the water is smooth and glassy. Natalie and Maria lead the way with Jeff the guide and David and Ted close behind the girls. 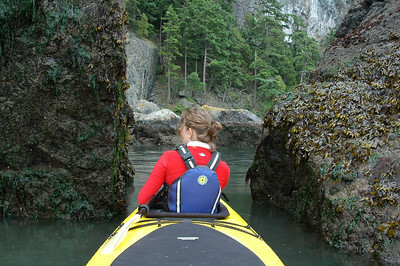 Amy checks out the exposed marine life as we pass through some slimy rocks at low tide. 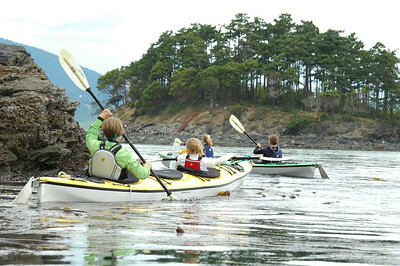 Maria looks back to check on the rest of her family after rounding the northwest corner of Cypress Island where a large kelp bed has been formed by the strong tide line. 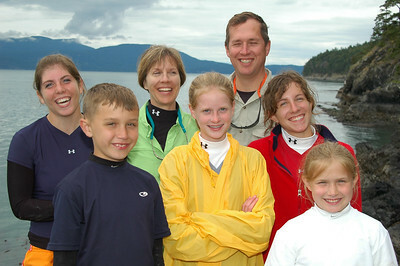 The Dickman Family on Strawberry Island (l. to r.): Maria (16), David (9), Kim (Mom), Natalie (12), Ted (Dad), Amy (16), Laura (9) - yes, that's two sets of twins. 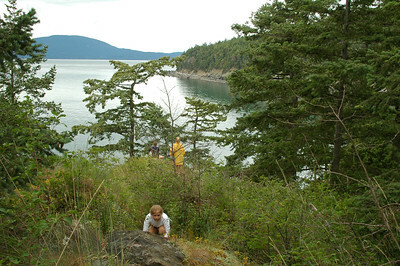 Laura ducks down low while Natalie walks out to where Maria has perched herself to take in the scene of the San Juan Islands as seen from the north side of Strawberry Island. 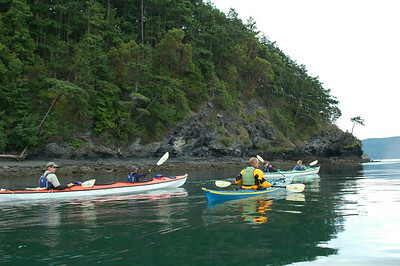 PUGET SOUND, WA - Heading north around Cypress Island back to camp. 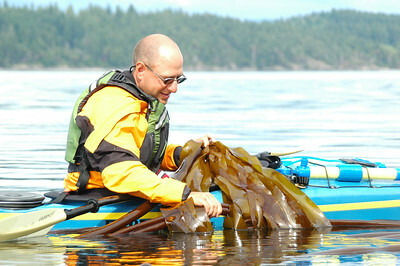 Jeff pulls up a bull kelp salad while trying to catch a kelp crab. 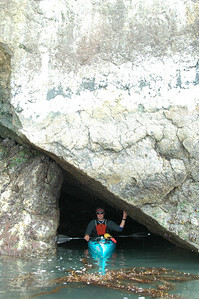 Chris backs himself into a little sea cave. 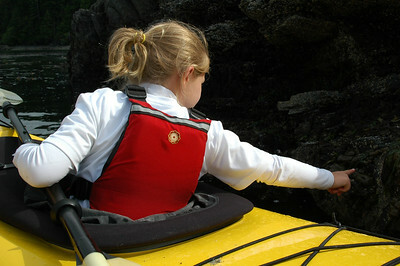 Laura pokes at a barnacle to try and make it spit. 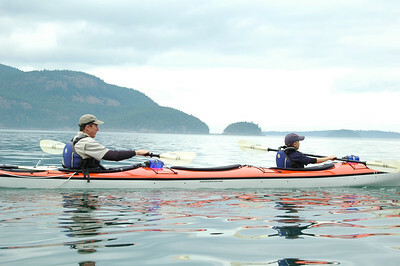 Amy and Jeff practice rolling the kayak over. 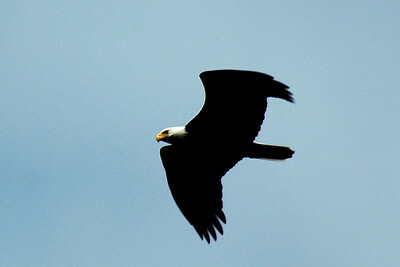 Our second bald eagle spotting. This one flies nice and close at the north end of Cypress Island.